ST. GEORGE – For well over a century the complicated and often uneasy relationships between conservationists, miners, ranchers, and the U.S. Forest service over the Grand Canyon watershed continue. With the park expansion in 1975, the placement of new borders pushed economic development further from the canyon, but seemingly not far enough. Now with the proposed National Monument designation status, conservationists will try to eliminate their opponents from the region forever. The Wilderness Society and Grand Canyon Wildlands Council, both headquartered in Flagstaff, Ariz., and the Center for Biological Diversity, based in Tucson, Ariz., in an effort to preserve the watershed, recently submitted a Proposal for National Monument Designation to the Bureau of Land Management. St. George News asked Rachel Tueller, Public Affairs Officer for the BLM Arizona Strip District, about the status of this proposal. But, the implementation of land management approaches may come in various ways, Tueller said, many of which fall under the National Environmental Policy Act. Proposals submitted to the NEPA processes are examined under a formal and complex procedure which provides for public input and hearings, environmental impact studies and other specified criteria before determination on a proposal is made. A NEPA process has not been initiated for the Proposal for National Monument Designation discussed in this article. The Grand Canyon Watershed National Monument proposal covers about 1.7 million acres, 7,000 of which are held privately. The land also contains four federal endangered species, 3,000 archeological sites, 259,000 acres of Ponderosa Pine forest. • It would lock up hundreds of thousands of acres in public lands, without Congressional approval or public input. • There would be restrictions on recreational activities primarily, ATV’s and off road vehicles. • It would end access to energy production and other job-creating economic activities. • It would reduce road density. • It would block pipelines and transmission corridors. • It would prevent new uranium mines. • It would halt the grazing of cattle. • It would protect old growth forest. The conservationists say that ecological threats to the proposed Monument lands include logging of ancient trees, high density of primitive roads, loss of landscape connectivity for wildlife, inappropriate grazing, and uranium mining. The USFS in Fredonia has been working on its proposal for 12 years now, but the conservationists keep appealing and litigating it in court. Lair said that the forest service does not profit financially from this operation. 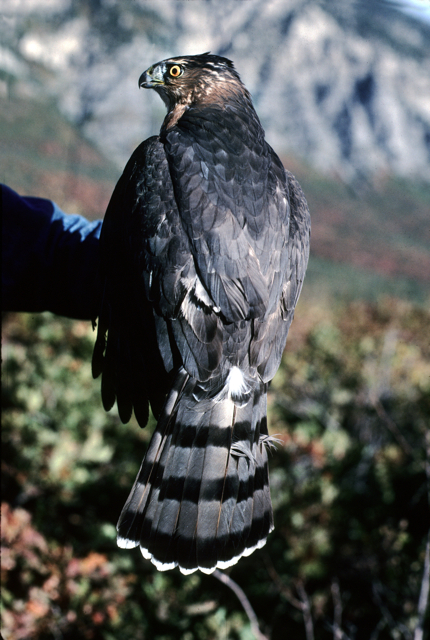 Richard Reynolds, Ph.D., has been studying the goshawk in the Kaibab National Forest for the past 22 years. “Their success depends on the health of the entire ecosystem,” Reynolds said. In other words, sustaining the birds means sustaining the squirrels they prey on, the seeds the squirrels subsist on, the forest structure that optimizes production of these seeds, and so on. “We have such a presence of goshawk researchers here and we know where all of the nests and foraging areas are. “Everything that we do is for the health of the forest and everything that lives in the forest. Unfortunately (what) the conservationists have is a stalemate and we have been at a boiling point for quite some time now. Reynolds said he hoped that the research he’s done would resolve this controversy once and for all. And the numbers do indicate that the Kaibab goshawk population is secure. The original boundaries of the Park deliberately excluded valuable grazing areas in order to allow such economic use to continue. There are currently 90-plus ranchers holding permits to graze cattle on the Arizona Strip land. “The federal government is crippling us. Utah Colorado and Wyoming have an estimated 800 billion to 1.6 trillion barrels of oil and we unable to get the federal permits to go get it. All the debaters said that the federal government must get out of the way and let the states manage their own natural resources. To view the entire proposal, click here. Screw this!!! Ive been to the strip a lot. If this happens the treehuggers have taken over completely, and our government keeps failing its people!!!! DO NOT LET THIS HAPPEN!! OBAMA IS IN BED WITH WHOEVER HELPS HIS EVIL CAUSE!!! Travis, we wish Obama would back this. He so far is not. National Parks and wilderness protection are originally American ideas. The U.S. is now behind the rest of the world in protected lands designations, at about 4% of its total landmass. This 4% is about equal to the amount of land that is covered with concrete and asphalt in our nation. The world average is now about 15%! Countries like Taiwan are even higher at 60%! Balance is what is needed to protect biological diversity, to promote economic health of societies, etc.